Beginning in 1899 a new machine, the “Hulett Iron-Ore Unloader“ (or shortly “Hulett“), revolutionised the discharge of this important raw material for the fast growing heavy industry. It came (and still comes) from mines at the Lake Superior and was shipped to the ports of discharge in Toledo, Huron, Lorain, Cleveland, Ashtabula and Conneaut at the Lake Erie. In the retrospect it can be said that almost 90 years of efficient ore-handling by this machine has contributed substantially to the industrialisation of the Ohio state. Before the first Hulett – named after its inventor George H. Hulett – came into service, the iron-ore has been discharged by cable or rigid rail tramways carrying self filling grab buckets. The essential drawback of those rope operated systems was the need for a large labour force to shovel the ore toward the opening centres of the ships hold, since the bucket could only come straight down to pick up the cargo. •	The grab bucket is fixed at the lower end of a rigid leg which is suspended on the top of a walking beam and vertically guided by a sub-arm. So a tilting of the bucket when touching the ore cannot occur. •	The bucket leg can be rotated around its vertical axis. •	The centre of the bucket is not in line with the centre of the leg. Together with the rotation this asymmetry substantially increases the pick-up area. Simultaneously Hulett increased the bucket capacity from the till then usual 1.5 tons to 10 tons (later up to 22 tons). This led to an increase of the hourly discharged ore from 50 tons to 275 tons and a few years after to 1000 tons. The walking beam was mounted on top of a trolley travelling on runway rails supported by two large girders. These girder frames were based on two gantries each carried by a long bogie travelling on rails along the bulk carrier on the ore-dock. The girders spanned four railway tracks and extended back to the rear gantry over a temporary storage area. The filled bucket has been discharged into a hopper which was placed between the forward ends of the main girders. The bottom of the hopper was provided with outlet gates and the contents was discharged as required into a larry which runs on an auxiliary track suspended from the under side of the girders. The filled larry moved to the point where the load was to be discharged either into the cars standing on the tracks beneath the main span or into the temporary storage pile under the cantilever at the rear. Up to four Huletts usually were involved in discharging a single bulk carrier. The crane operator had its station in the vertical leg just above the bucket and travelled each time for and back from hopper to hold. He controlled all motions of raising and lowering, opening and closing the bucket, of travelling the trolley back and forth, and moving the machine along the dock from one hatch to the next. The second operator, the “larryman“, was stationed in a cab on the larry and controlled the weighting of the ore, the movement of the larry, and the operation of the outlet gates. The task of a third man on the machine is sufficiently described by his designation as “oiler“. In the 1970s were plans in the conceptual stage to build 50 ton bucket capacity Huletts but they never materialised. However, self unloading vessels and 1 000 foot ships surpassed Hulett Ore Unloaders in terms of economy and efficiency. 1992 the last cargo has been unloaded by the Cleveland Huletts. The prototype of the model was in service at the C&P Ore Dock in Cleveland/Ohio from 1912 to 1992. With a 17 ton bucket and a one minute operation cycle this Hulett rated at 1 000 tons per hour. •	Application of classical construction principles in a mix of framework and two-dimensional faces. •	Composed of well defined subsystems: bridge, trolley, beam, bucket, larry. •	The space allows a mechanisation of all functions. •	Freedom of design for decorative elements, e.g. railings, stairways, windows etc. Control:	control box with 8 switches connected via a 10-wire cable and D-type connectors. Power:	16 VAC via 2-wire cable and phone jacks with half wave rectification in the control box. 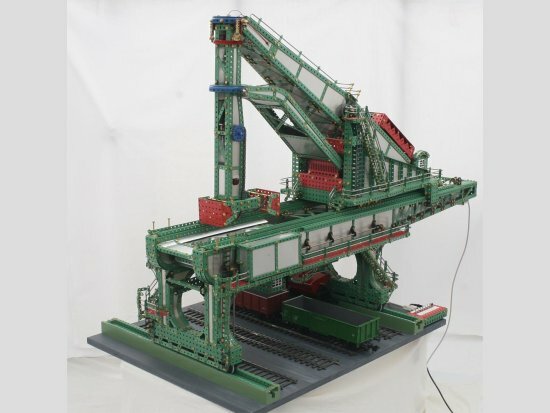 Most parts are from Maerklin/Metallus, some from Meccano and some few from other systems. The flexible plates are home made from a 0.5 mm aluminium plate. Bolts and nuts are pure brass slotted screws M4 and hexagonal nuts with 7 mm wrench size. The main framework consists of two 12½“ bogies, each carrying two 6½“ piers which support the main girders with a length of 51“ and a cross section of 1½“ x 3½“. Each bogie rolls on 2 x 6 tyres fitted to 1“ pulleys. 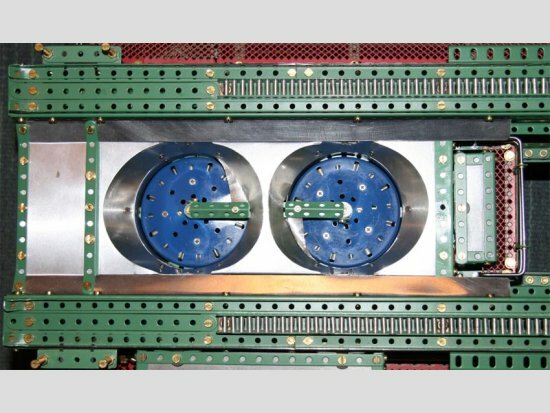 These wheel-pairs run in an U-formed track built from two normal and two narrow angle girders with a Delrin rack strip in the centreline. The drive is performed with the aid of a 67T Delrin gear wheel pinched between the two tyres of the first axis. This solution is not really conform to the original. However, since the wheels are almost hidden and the incorporated simple, place saving safety clutch it may be acceptable. The elegant swing of the piers are composed of bended standard parts and special aluminium plates. This form seems to be rather exceptional for a pure functional construction, however, it may be explained by the hint that the time of erection (1912) was the era of the Art Nouveau. The main girders of the bridge consist of two sides from which the two inner ones are planked totally with aluminium plates whereas the outer ones are only partially closed. The cantilever part is made from narrow strips which form a classical framework. 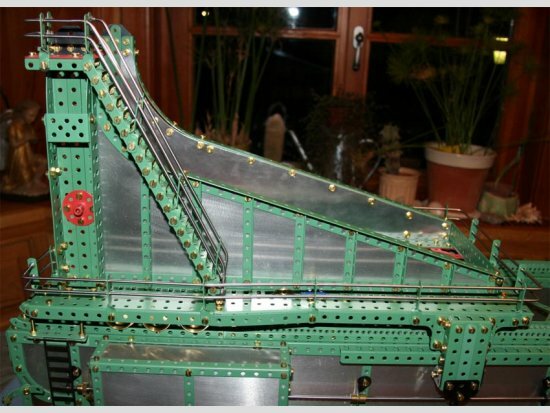 On the upper side of each girder are two guide rails for the trolley and a gear rack for its drive system. 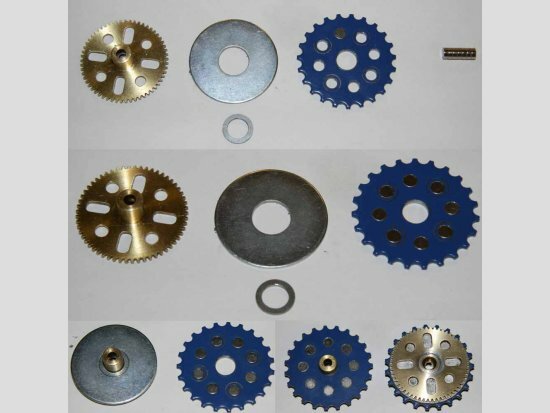 This gear track is made from an U-girder by drilling additional holes at ¼” distance in both sides and inserting 4 mm Ø x ½” split-pins as teeth. There are two rail pairs at the inner side of the girders. The first one carrying the larry is a tilted track ascending from the front side to the rear, The second pair is near the upper girder edges and extends horizontally from the first to the rear gantry. This track is for the movable ore hopper, which is normally in the most forward position. Both tracks are additionally used to transmit electrical power to the vehicles. The ore hopper has two funnel-shaped cones which are closed underneath by bevelled discs. To discharge the hopper these plates are rotated and transport the ore against radial deflectors which then cause a shift towards a bottom- opening at the periphery of the discs. For maintenance purposes the not self-propelled ore hopper can be moved in a more backward position. Then the bucket can be lowered between the girders to the railroad tracks beneath the bridge, e.g. in order to change the nagged bucket shells. There are gangways on both outsides of the main girders which can be reached by stairs or a caged ladder. The railings on the gangways and the stairs are made from 3 mm Ø silver steel rods with small sleeves at the bearing holes of the stanchions made from bended narrow 2” strips. In front of the left side gangway under a removable cover are two mechanically and electrically coupled motors for the travelling of the bridge. The rotation is transferred with two axles to the rear corners of the gantries. Here contrate wheels deflect the rotation direction towards the first axes of the bogies where 1:10 worm gears connect the down coming axes with the safety clutch wheel pair. This vehicle consists of a supporting frame hanging on four bogies each with an inline pair of ¾” flanged wheels without bosses (home made). The length differences of the fore and aft bogies compensate the gradient of the track so that the frame is horizontal. It supports the larry hopper beneath, an operators cab in front and a motor platform at the rear side. The hopper is closed by two gates which can be opened via a linkage driven by an electromagnet under the motor platform. The movement of the larry is provided by a motor with a winding drum on each end of the driven axle. On each drum formed by two ¾” flanged wheels one end of a rope is fixed. The middle part of the rope is held at the rear end of the cantilever by two ½ “ deflection pulleys to allow for a length compensation if the drums wind unequally. The larry is pulled up the inclined track by means of these rope and descends by gravity when the rope is released. The electrical power is picked up from the rails by the flanged wheels of the larry. One rail and the corresponding wheels are connected to the main frame ground whereas the other side rail and wheels are insulated by using plastic washers and plastic screws. Since for the three functions of the larry only two conductors are available a trick has been used: if a DC voltage is applied, the vehicle moves fore or aft according to the polarity. If an AC voltage is supplied, the electromagnet is activated and opens the gates which are closed by gravity after the power has been switched off. The discrimination is performed by a relay which reacts more rapid on DC. In this case it connects the motor to and disconnects the magnet from the line. In the AC-case the relay initially tries to follow the voltage, but the coil can react during the zero crossings and shunts the line decreasing the relay voltage below the operating limit. The operators cab is fixed at the front end of the supporting frame. Its functionless interior shows a seat, a hand wheel and two control levers. The entrance door is placed so that the cab can be accessed from a platform on the front side of the first gantry when the larry is in its most lowest position. The 19½” bogie of the trolley has been formed by two rigid girders connected by bottom plates. Two long L-girders were screwed on four shorter U-girders giving a closed 1” x ½” profile with external flanges on each side. The U-girders let in the middle a clearance for the driving roller chain wheel. Each bogie girder carries beginning on the front side 3 inline pairs of 1 1⁄8” flanged wheels running on the double rail system on the main girder and additionally one flanged wheel for the outer rail near the rear end. At the position of the rear flanged wheel another wheel is mounted at the lower end of an outside lying rigid bearing structure. This wheel is guided overhead by an external rail fixed at the upper edge of the main girder of the bridge. So the tilting of the non-balanced trolley is avoided. The rail lengths and wheel positions are so designed that at the most forward position the trolley can be lifted from the bridge. The triangular shaped side walls of the trolley are based on the bogies and are formed by shaped aluminium plates with normal angle girders at the edges and narrow angle girders as vertical struts. The bearings for the main and auxiliary beam are placed on the top and in the middle of rigid U profiled towers which are based immediately on the bogies at the front of the side walls. To avoid distortions of the persistent axles and its bearing holes bush wheels and cranks have been used to strengthen the bearing points. The lateral galleries are made from L- and Double L girders (2 x 1 hole and 3 x 1 hole resp.). 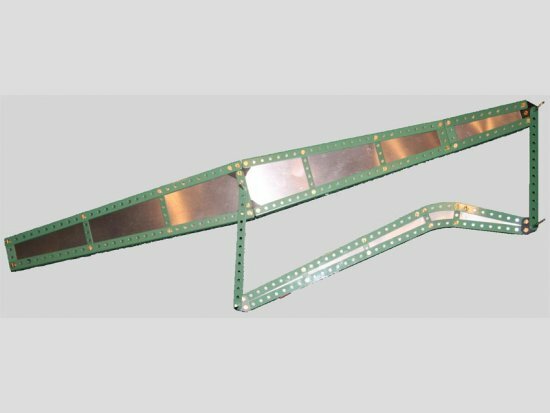 The transitions between the broad part in front and the narrower part at rear have been made by cutting flanged sector plates. Railings and stairs are made in the same way as on the bridge. 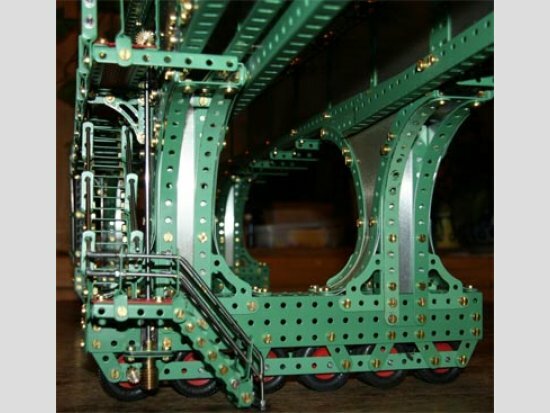 The drive of the trolley is performed by 23T roller chain wheels meshing the gear racks on the bridge. Although the pitch of wheels and racks is slightly different (6.0 mm vs. 6.35 mm = ¼”) no problems occur. The driving wheels have elastic bearings in order to allow for slight irregularities of rails, racks and the involved wheels. Both driving roller chain wheels are driven by a 19T/57 gear wheel combination where the 19T wheels are fixed on a common axis propelled by a motor with internal speed reducer over a simple 1:25 worm gear. To compete with gear rack irregularities and external applied forces safety clutches on both sides are mandatory. A very effective and place saving variant is a magnetic clutch between the driving 57T gear wheels and the 23T roller chain wheels. For that purpose 2 mm x 5 mm Ø Neodym magnets with an adhesive force of 650 g each have been glued into the enlarged holes of the 23T wheels. The antipoles are zinced steel washers which have been soldered on the 57T brass wheels. The power supply of the trolley is provided by a 10-lead flat cable and D-type connectors. The cable is laid in a wide loop beneath the trolley and allows its free movement within the total range. The most special attribute of the Ore Unloader invented by George Hulett and patented in 1898 is the beam arrangement providing the vertical orientation of the bucket leg by an auxiliary arm. To fulfil this requirement the distances of the pivotal points must be equal by pairs and thus form the edges of a parallelogram. The bending of the auxiliary arm increases the downwards clearance immediately in front of the bridge. The beam sides are made from 0.5 mm aluminium plates with angle girders at the edges and narrow strip cross elements. The sides are connected by a framework of normal strips and partially with plane elements. At the upper side of the beams runways with railings allow the service people to reach the maintenance points of the construction. The total length of the main beam is 33½”, the distance from the tip hole to the pivot point (which is also the length of the auxiliary beam) is 18”. The edges of the leg are angle girders which form in the upper part a rectangular cross section (1½” x 2”) and in the lower part a quadratic one (2” x 2”). The sides are covered with plates while front and rear side show a framework construction. Only in the lower part of the leg all sides are closed with plates and form the operators station which is denoted by window openings. The suspension of the rotating leg is performed by a 2½” bush wheel supported by seven rolls mounted on screws which are fixed in the flange of a 80 mm Ø round plate. Two of the screws are longer and serve as pivoting axes for the suspension on the top of the main beam and simultaneously for the deflection pulleys for the rotary drive wire ropes. To reproduce the original rotation mechanism a twofold horizontal pulley embracing the leg is required where the pulling ropes from left and right are winded separately. This pulley has been built by separating the plates of a 3” pulley, inserting a plane 3” disc and recombining the triplet. In order to make the rope lengths independent from the inclination of the beam two deflection pulleys must be placed on the pivot axis. A second pair of pulleys is required to lead the ropes correctly in height and direction to the appropriate horizontal pulley to ensure an undisturbed winding and unwinding. 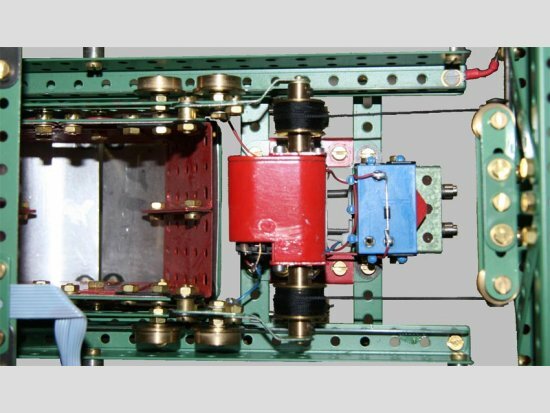 The vertical guidance of the leg is performed by the auxiliary arm pivoting the outer ring of a two part flanged round plate (Maerklin #10396), which is as rare as a reasonable application for it. Four small flanged rolls placed on a cross of axes support this ring embracing the leg. The rear part of the main beam is used as machine room containing the beam luffing and the leg rotation drives which partially compensate the excess weight of the beam front section with the bucket leg. The luffing mechanism for the main beam is a six-rope hoist with three pulleys at the rear end of the main beam and three pulleys in a recess at the rear end of the trolley. The self-contained hoist assembly is mounted on a 7 x 11 hole flat plate. 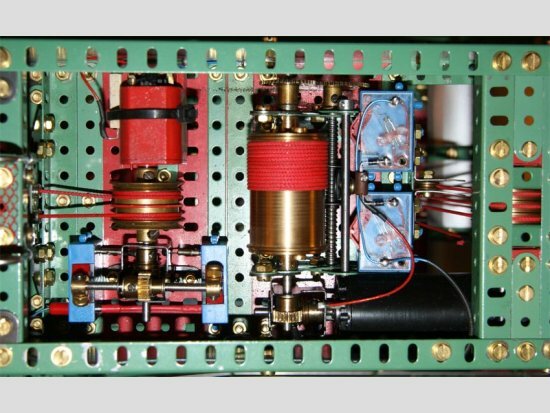 A strong Maxon motor with an internal planetary gear drives a heavy drum (51 mm x 36 mm Ø, resp. 2” x 1.4” Ø) using a 1:19 worm gear. To increase the counterweight the drum is a lathed massive brass cylinder. Parallel to its axis a lead screw with a guide lug for the rope is driven from it by a 19:50 spur gear. Rope and drum diameter, gear ratio and screw pitch are coordinated in such a way that the rope is properly winded side by side. In addition a bolt head fixed on the guide activates two limit switches which can be adjusted precisely repeatable by shifting the fixations in a slot hole. The incoming rope is wearless routed to the lug by three ½” pulleys and a guiding fork. The double drum for the ropes of the leg turning mechanism is built from two 1 1⁄8” flanged wheels faced together and separated by a flat disc having the same diameter. It is driven directly by a DC motor with internal cascaded spur gears. To ensure a proper winding the ropes are leaded by two fixed eyes near the drum. In order to reduce backlash the cable ends run though small holes inside the wheels where short surrounding coil spring span the ropes. The same motor also drives a worm gear bearing two collars at the ends of the output axis which activate two limit switches. With the aid of this device the rotating range of the leg is limited to ±270°. The machine room is closed by a plug in top cover consisting of a 11 x 17 hole flat plate with low sidewalls in open work style. A 1 mm lead plate screwed under the flat plate increases the counterweight of the rear end by about 0.34 kg. 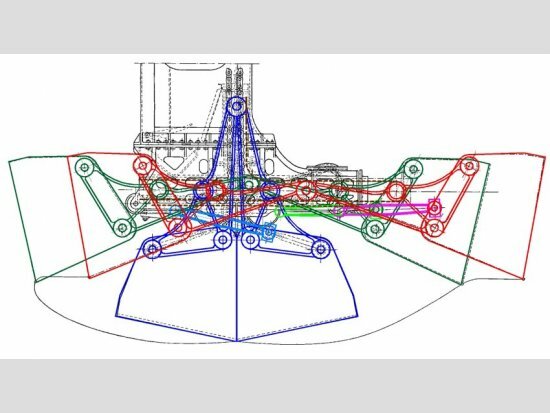 The actual bucket is the 2nd version of the asymmetric shoe mounted at the lower leg end and modelling now very closely the original kinematics of the opening and closing mechanism. The bucket assembly consists of two side frames, two U-shaped shells with its suspension frames in between and a very special centre part. Each bucket shell is suspended at two edges of a pair of triangular guiding frames. The 3rd edges at the top are pivotable connected by pairs. The guiding frames have flanged rolls at the pivot and midway on the outer triangular sides. These 2 x 3 rolls run in U-shaped slotted links which are fixed at the inner side of the side frames. The three parts of the slotted link are arranged like a ⊥. The midway rolls move in the horizontal slots while the top rolls move in the vertical and in the horizontal slots, which are on the cantilevered side. The opening is performed by a roller chain within the leg which after being horizontally deflected by a chain wheel is pulling on a ram pushing the shell on the cantilevered side outwards. Thereby the connecting pivots are moving downwards and push the other shell outwards so that both shells open simultaneously. When the pivots reach the horizontal level the rolls enter now the horizontal slots at the overhanging side. Pulling the chain further moves the opened shells commonly towards the extended side of the shoe until the incoming shell touches the leg. This shift causes the corresponding slots to move outwards like a telescope. 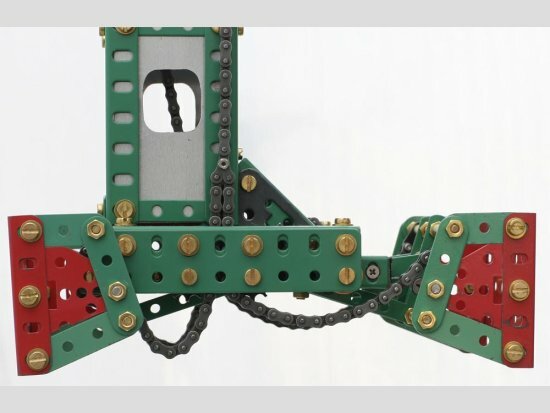 One pair of chains on each side of the leg is attached at the shells upper edges and joins to single chains midway between the bucket and the driving chain wheels on the leg. Pulling these chain closes the bucket. Due to the loose chains on the incoming side the shells are shifted first in its middle position and let the expanded slots come back by the force of a spring. After having reached its middle position he pivot rolls enter the vertical slots and the bucket closes. All chains – one for opening, two for closing – are driven by three 23T roller chain wheels on a common axis which is placed at half height of the leg. The axis is rotated by a small DC motor with internal planetary gear and an intermediate 1:25 worm gear. Two adjustable cams on the chain wheel axis activate limit switches inside the leg. Although the construction of this model took nearly one and a half year (with interruptions) the job isn’t completely finished yet. Some details have still to be improved and the outstanding construction of a bulk vessel torso to explain the Huletts function more descriptive is still pending. Who wants to learn more about this fascinating machine may search at www.youtube.com with the terms “Hulett, Cleveland” and will find a very informative and impressive 10 minute video.